KARACHI, 2oth March 2011 : Demonstrations were held in different areas of Karachi on Sunday in protest against a new wave of killings across the city, mainly on political and ethnic grounds, claiming over a dozen lives on Sunday. The protesters turned violent at a few places where exchanges of fire between armed men and law-enforcement personnel left one person dead. Three vehicles were set on fire. 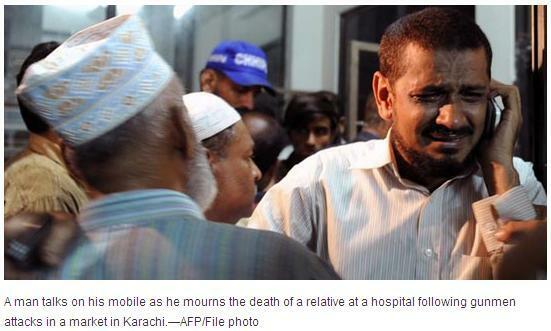 The protests began when dozens of people, including Muttahida Qaumi Movement (MQM) workers, staged a sit-in for about half an hour on Shahrah-i-Pakistan near Liaquatabad during the funeral of Shahzad Hussain, a party activists killed on Sunday. 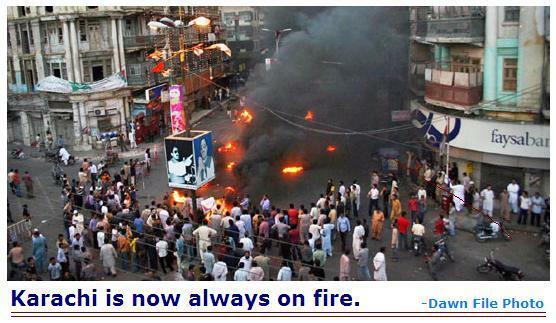 They set tyres on fire and chanted slogans against the killing and the ‘extortion mafia’. Violence intensified when armed men opened fire near Teen Hatti Bridge, prompting law-enforcement personnel to act. “There was a group of armed youngsters who were firing shots into the air and attacked a Rangers vehicle parked there,” Jamshed Town SSP Amir Farooqi said. 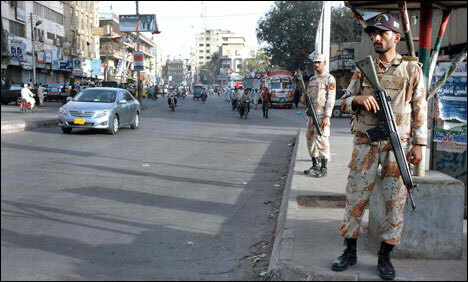 Desolated roadways in Karachi with heavy police patrolling. Photo - The International News. “The firing elicited retaliation from the law-enforcers that left a man dead, but it’s not yet clear whose bullet had hit him,” he added. There was no official version from the Sindh Rangers on the incident. Demonstrations were also held in Gulshan-i-Iqbal, Burns Road and Federal B. Area. Parts of Gulistan-i-Jauhar, Qasba Colony, Nazimabad, Lyari, Kharadar and Site areas were paralysed by incidents of intense gunfire. A passenger coach was set on fire in Nazimabad and a truck and a bus in Safoora Goth near Gulistan-i-Jauhar. By the time a ministerial committee of the PPP and MQM decided to meet to discuss the incidents of violence, the guns had fallen silent, although tension and fear kept the residents of the strife-hit areas indoors and business suspended. Despite repeated attempts, the newly-appointed city police chief Saud Mirza avoided to say anything about the situation. Sindh Home Minister’s Adviser Sharfuddin Memon said a meeting of the ministerial committee had been called to discuss the Karachi situation and law-enforcement agencies had been placed on high alert. He said a positive result of law-enforcement measures would be evident soon. Mr Memon said the Rangers had special powers and its action had always proved effective in such situations. IGP Sindh calls for special security on March 23rd, Pakistan Day. Courtesy : All sources and Agencies.